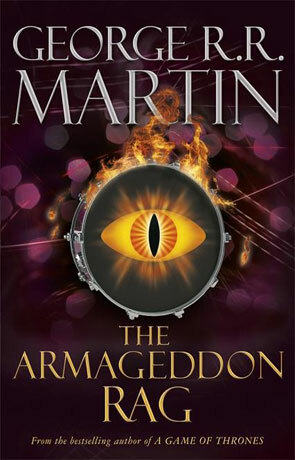 Way before be became a household name with his Songs of Ice and Fire series, George RR Martin wrote a number of stand-out novels and Armageddon Rag is often seen as one the most off-the-wall if not his finest early works. Nominated for the Locus and World Fantasy awards it failed to gain any notable sales when first released in 1983 and has been described by the author as both his most ambitious and experimental novel but commercially a "total disaster" and one which almost destroyed his career. Those wonderful people over at Gollancz have gone to the trouble of republishing the novel and it proves to be not only highly accomplished but a damn fine read. The story follows the frustrated former hippie novelist Sandy Blair who becomes involved in the investigation of the rather horrific murder (including the heart being torn from the body) of the successful rock music promoter Jamie Lynch. Lynch managed several popular Rock bands including the pretty much legendary group "the Nazgûl" (named after the nine Dark lords from Tolkien's epic). Some form of link to the band seems clear as his body was found on the tenth anniversary of the Nazgûl's break-up but not only that, his broken body was placed on a poster describing the band's infamous "West Mesa" poster, a gig where the lead singer Patrick Henry "Hobbit" Hobbins had also been murdered. But as one door closes another opens and the Nazgûl are once more free to fly (or at least play very loud music). One of the things that really grabs you about this book is the amount of detail and sense of realism that goes into the backdrop (1980's and 1960's), characters and above all the imaginary group "The Nazgûl". From concert set lists to album track timings the author has gone to an incredible amount of time and effort it breathing life into this fictional group (which draws a parallel with that of Spinal Tap) and he sets the scene perfectly at the start of each chapter with famous rock lyrics from bands like the Creedance Clearwater Revival, Jimmy Hendrix, the Beatles and Simon and Garfunkel (to name a few), music that resonates through the prose and helps to provide a very distinct voice. For the majority of the story the book is very much without any tropes of the genre at all and when we do see a small element of the supernatural slowly creep in the feeling is ever so powerful for its late, brief appearance. Written 30 years ago in the early 80's but reflecting back on the 60's, if you've lived through either period it's so easy to reminisce. Even if you haven't it's a wonderful window back into those times, mostly through the music of the 60's and the style of the 80's. There is also a reflection of those who have grown and moved on from the 60's scene and how they have grown, aged and changed 20 years later along with what effect the era of "flower power" really had on their lives. Martin makes excellent use of some very interesting characters to breathe life into the story and the result is pretty compelling fiction. There is an effervescent energy to the prose, the narrative almost takes on a life of it's own and it's all wrapped up in the strong flavour of the period. I loved the slightly ambiguous ending too, it's one that stays with you long after you've finished reading and the novel really does show just how talented Martin is. An exceptional novel with a unique clarity, irresistible style and a powerful voice. Written on 23rd May 2012 by Ant.